Tron: Legacy is a good movie. I haven’t watched TV for the past five years and I don’t pay attention to movie hype, except what I see on IMDB. So when I first saw Tron: Legacy for the first time, I wasn’t sure what to expect. I hoped it would be good because I grew up loving the original Tron, but I didn’t know how they would live up to that film’s originality. It turns out they didn’t, but that’s actually not a bad thing. As I walked out of the theater with my wife, she pointed out that Tron: Legacy had a lot in common with its predecessor – similar lines of dialogue, visual designs and plot points. But I had a nagging feeling that it reminded me of another movie even more than Tron. And, coincidentally, it was another movie that came out in 1982 – Jim Henson’s The Dark Crystal. Good and evil are split into two distinct halves. The evil half takes control of the world and exiles the good. The evil half kills almost an entire race. The genocide survivor(s) team up with the good half. The heroes must take a key (Identity disc/crystal shard) and confront the evil half to restore order. There’s a ticking clock. The heroes must accomplish their missions before either the portal to the real world closes or the planets move out of alignment. A traitor seeks to thwart their efforts. At the end, good and evil are reunited and the world is reborn. In both films, there is a good version and an evil version of the rulers of the world. We get to see Kevin Flynn, the main character from the first Tron, create CLU in a flashback, but we never get to see the separation of the Skeksis and Mystics in The Dark Crystal. That’s because The Dark Crystal keeps the nature of these two beings a secret until the end. An interesting difference between the two films is the reason for the separation of good and evil. 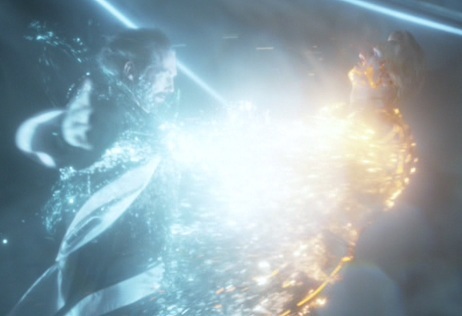 In Tron: Legacy, CLU is designed to help Flynn make a perfect system, but he misinterprets that command and tries to destroy anything he sees as imperfection, including living beings. 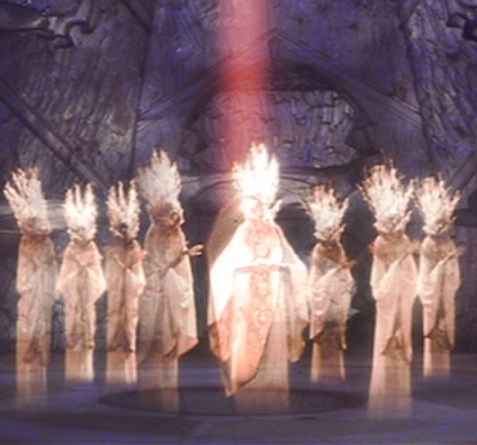 In The Dark Crystal, the rulers were arrogant and delusional about their power, so they shattered the Crystal of Truth. The details are a little vague, but I think they wanted to show that they were so wise they didn’t need the crystal’s power to guide them. The results in both films are the same, though – good and evil separate. Evil has an easy time taking over the world once it’s on its own. CLU convinces a whole army of programs to side with him against their creator, and Flynn barely manages to escape. Again, The Dark Crystal is vague in the opening monologue about how the Skeksis took power. It makes sense that the Skeksis and Mystics wouldn’t want to have a direct conflict because they would essentially be killing themselves. And the aggressive Skeksis would, of course, be more eager for power than the peace-loving Mystics. One difference in this setup is that in Tron: Legacy, only Flynn gets old while in The Dark Crystal both the Skeksis and Mystics get old as time goes by. This situation puts Flynn at a disadvantage when trying to confront CLU. CLU is eternally young and strong, but Flynn soon gets old and weak. But since both the Skeksis and Mystics have aged for 1,000 years, both face the very real danger that they could die out before reaching the Great Conjunction when all the planets align and they have a chance to repair the damage done to the Dark Crystal. The evil halves in both films commit genocide. Because CLU deems ISOs to be imperfect programs, he kills almost all of them. But one escapes and is sheltered by Flynn. To keep the prophecy that a Gelfling will repair the Dark Crystal from coming true, the Skeksis murder every Gelfling they can find. But they miss two, one of whom is protected by the Mystics. The difference here is the reason why the villains commit genocide. CLU kills because he thinks that is what he was designed to do. He’s not really evil; he’s just malfunctioning. The Skeksis want to rule their world forever, so they try to eliminate any obstacles to that goal. But it seems like even if the Dark Crystal is fixed, the Skeksis would still get their wish and rule the world, but they would also live forever and be more enlightened. It seems like they can’t lose in this situation, so why make it harder for the heroes to do their work for them? Maybe they like getting old and being evil. Who knows? After the genocide, the heroes join forces to fight back. Quorra is the only ISO who survives CLU’s attack. She waits for many years until Flynn’s son Sam arrives, and she helps him on his quest to escape and restore peace to the Grid. Jen and Kira are the only Gelflings who survive the Skeksis’ attack. Once Jen’s mentor dies, he sets out on a quest to fix the Dark Crystal, and he’s soon joined by Kira. Without Quorra’s and Kira’s help, the main characters of the two films wouldn’t have been able to complete their missions. They both sacrifice themselves to help their friends and must be brought back to life by wise sages. The two girls even have similar-sounding names. The obvious difference is that Sam isn’t an ISO like Quorra, but Jen is a Gelfling like Kira. ISOs are supposed to be very human versions of programs. From the first Tron film, I got the impression that all programs could think, learn and grow independently of their users. But Tron: Legacy seems to suggest that ISOs can do even more than that. They can create new life and be imaginative, so I think it’s safe to assume Quorra and Sam are perfectly compatible for each other, like Jen and Kira are. A MacGuffin is required to restore order to the world. 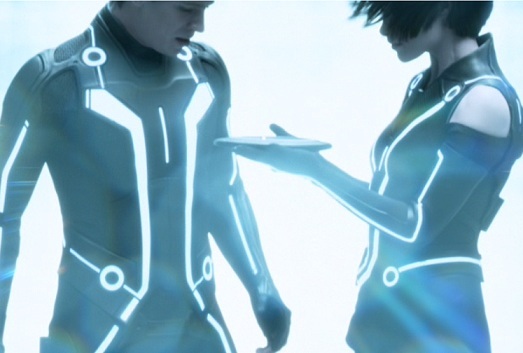 Tron: Legacy’s MacGuffin is Flynn’s disc. CLU wants to use it to enter the real world and take power, and Sam wants to use it to get back home. 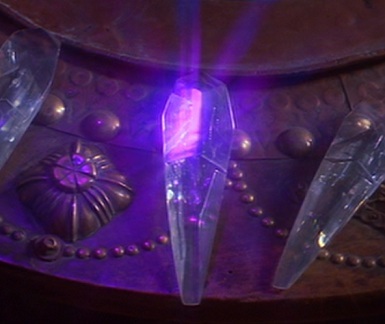 The Dark Crystal’s MacGuffin is the crystal shard, a piece of the Crystal of Truth that was broken off when the rulers cracked it 1,000 years ago. The Skeksis want to keep it away from the Dark Crystal so they’ll rule the world forever, and Jen and Kira want to use it to fix the Dark Crystal so the Skeksis and Mystics will rule forever. One difference between the MacGuffins is that Flynn has his disc with him, so there’s no need to look for it, but Jen and Kira have to first find the crystal shard before they can complete their mission. The Dark Crystal never bothers to explain why an ancient woman named Aughra has the crystal shard. She says she was there when it shattered, so maybe she knew the rulers. But why wouldn’t the Mystics take the shard with them when they left the castle, especially if it’s integral to making the prophecy come true? For that matter, who made the prophecy? Do the Mystics have their own scriptures? And what does it mean that Anakin Skywalker will bring balance to the Force, and Harry Potter is the Chosen One, and… (Deep breath) Sorry about that. Sometimes I just have to accept movies’ logic and not expect answers. Moving on, then. To make things more suspenseful, both films have a time limit. Sam only has a few hours to get to the gate before it closes, and Jen and Kira must repair the Dark Crystal when all the planets align, which only happens once every 1,000 years. If they fail, they risk causing the end of the world. No pressure. Technically, Sam could buy himself more time, if he fails to get to the gate in time, by learning how to send a message to Alan Bradley’s pager, like CLU did. He could just explain the situation to him, have him turn on the portal and the problem is solved. Jen and Kira, on the other hand, can’t stop the planets’ orbits, so there’s no second chance for them. What would a fantasy film be without a whimsical little character who turns out to be a Judas Iscariot? Harry Potter has Draco Malfoy, Lord of the Rings has Gollum, Star Wars has Lando Calrissian… okay, so maybe they’re not all whimsical characters, but they’re definitely traitors. Tron: Legacy has Castor/Zuse, who runs the End of Line Club and says he wants to help Sam when all he really wants is to steal Flynn’s disc and give it to CLU. 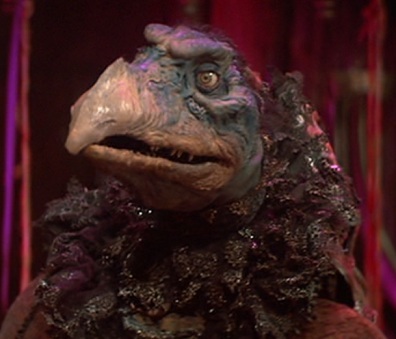 The Dark Crystal has Chamberlain, the most memorable Skeksi because he whimpers a lot. He tries to tempt the Gelflings to trust him so he can turn them over to his fellow Skeksis and restore his reputation. Neither plotline really goes anywhere because the traitor winds up having little effect on the story. Zuse steals Flynn’s disc, which forces the heroes to make a slight detour to retrieve it. Jen is tempted to follow Chamberlain for a few seconds until Kira reminds him that the Skeksis are evil. In both cases, there’s no harm done in the end. The solution to the problem is to reunite the good and evil halves. 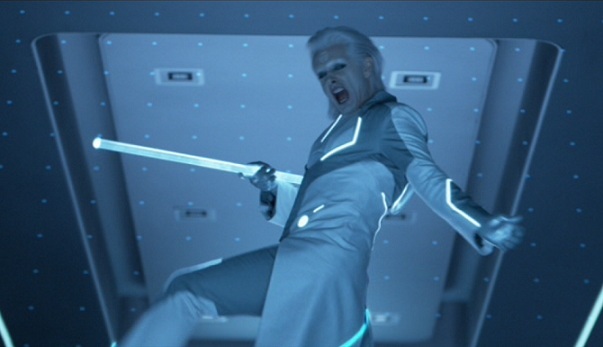 In Tron: Legacy, Flynn finally has to confront CLU and join with him to save his son and send him home. The movie doesn’t explain what this reunification does to the Grid. Is it destroyed? Is it repaired, like when the MCP was destroyed in the first Tron? In The Dark Crystal, the Skeksis are pulled back into the Mystics and they become an entirely different race of heavenly beings. After giving a few words of advice to Jen and Kira, they leave. Are they still the rulers of the world? Is this how they ran things before? Shouldn’t they take the Crystal of Truth with them so nothing will happen to it? I guess these questions aren’t important. It seems like the plots of both movies could have been resolved long ago. In a very out-of-character move, Flynn decides the best strategy is to simply do nothing when he has a chance to escape his digital prison. What happened to the Flynn of the original movie who said, “Well, hey, you know anybody who has an army for rent, that’s fine. But my user told me to go take that sucker out… or I’m never getting out of here”? It turns out Flynn can easily get rid of CLU by joining with him. Also, he designed the Grid, so he should be able to create his own army and outsmart his creation. As I pointed out earlier about The Dark Crystal, the Skeksis wouldn’t dare kill the Mystics because they are them, so it would be suicide. So why didn’t the Mystics find the crystal shard hundreds of years ago, march back into the castle and tell the Skeksis to stop killing innocent creatures until the time of the Great Conjunction? I don’t know. That wouldn’t have been an interesting story, I suppose. I would argue Tron: Legacy’s story has more in common with The Dark Crystal than the original Tron. All the main plot elements are virtually identical. 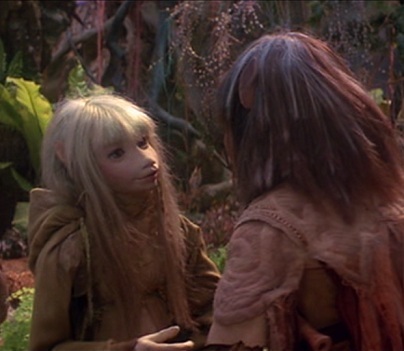 I enjoy both movies and it seems like the Tron: Legacy filmmakers didn’t set out to knowingly copy The Dark Crystal. It’s just a fun little accident that they are so similar. If you get a chance, watch these two movies back to back and you’ll probably agree with me that they’re very similar. By the way, this is my third review in the past two months of a movie starring Jeff Bridges. My first was Iron Man and then last week I talked about John Carpenter’s Starman. Bridges sure is a prolific actor, right up there with Dennis Quaid and Samuel L. Jackson. But I promise this will be the last one with him for at least a little while. All photos in this article are the copyright of their respective owners. This entry was posted in Movie Matchups and tagged 1980s, action movies, dark crystal, films, fun, funny, jeff bridges, jim henson, movie review, movies, science fiction, star wars, starman, tron. Bookmark the permalink.